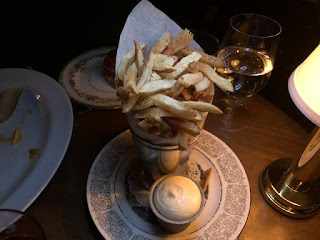 Chicago is known for many things; the classic Chicago Dog loaded with onions, mustard, relish, tomatoes and pickled peppers, the hefty Deep Dish Pizza, the Italian Beef Sandwich at Portillo's and of course the Burger at Au Cheval. 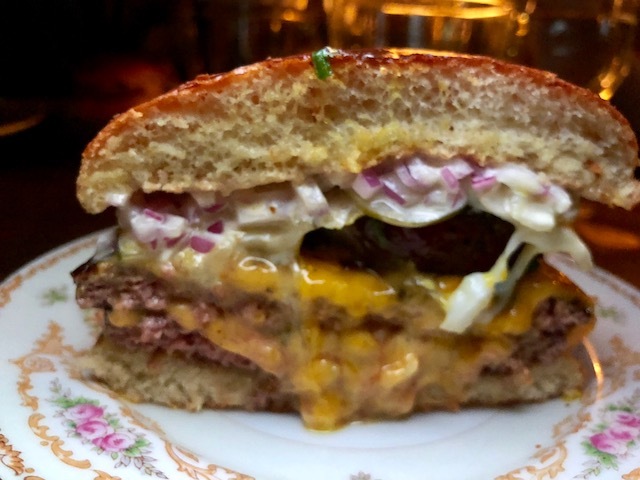 I haven't been to Chicago in years but luckily some of these iconic classics have leaked into NYC with deep dish pies at Emmett's, Italian Beef at Hanks and even the infamous Au Cheval Burger at Four Charles Prime. Hailed by many as the best burger in the country this brings together two grilled all beef patties layered with Kraft American cheese, then topped with thick slabs of bacon, fried egg, chopped red onions, Dijonaiise, and pickles all on a toasted bun. It arrives at the table whole, then gets sliced at the table in order to reveal the inside in all of it's messy, juicy food glory. 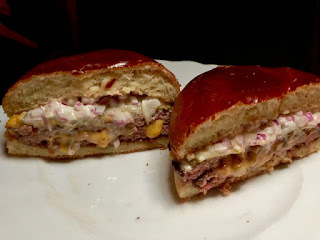 This burger is absolutely orgasmic at first; the creamy yolk seeping into the juicy meat with the smokey, peppery backbone of bacon lingering after each bite. I was worried the burger might fall apart but somehow that toasted bun soaked in all the juicy innards and held together to the very last bite. We had ordered one Cheval and one regular Cheeseburger (sans egg and bacon) which was the perfect decision. After finishing half of the Au Cheval I was more than content with the regular cheeseburger as I was in a bit of flavor overload. This burger is certainly incredible but it's also very, very rich. 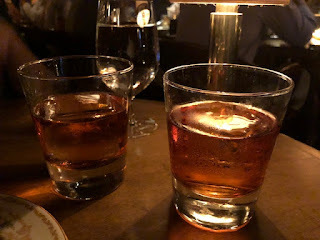 We paired our burgers with a side of fries and a couple of strong, house made Negroni's which just seemed required at Four Charles Prime. The tiny space absolutely oozed with dark, old school New York City vibes. It's the kind of place I try to breathe in, expecting the deep aromas of leather and cigar that never quite surface. Meat, cocktails and leather- that's the name of the game at Four Charles Prime. And if you can actually score a reservation it's worth every single penny.